UDA Holdings Bhd expects its new master plan for the Pudu Jail redevelopment project to attract local and foreign investors as it seeks partners to share the development bill. "We need to find the most suitable model that will attract investors and bring in funds for the project," said UDA chairman Datuk Nur Jazlan Mohamed. UDA, whose assets are estimated to be worth RM2 billion, has a debt of more than RM900 million. Its cash in hand is about RM90 million. 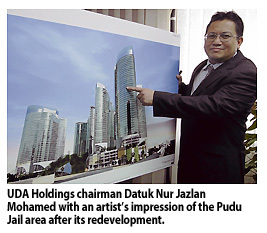 Nur Jazlan had said in June that the Pudu Jail redevelopment project would bring in new sources of recurring rental income to UDA, estimated at between RM200 million and RM300 million a year, and more importantly, a secure future. 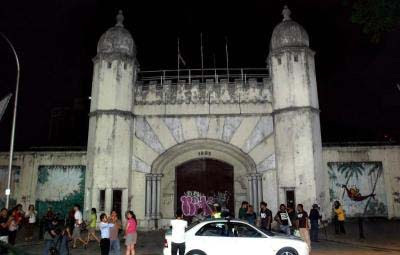 The 8ha Pudu Jail site became Kuala Lumpur's main prison from 1895 until its formal closure in 1996. An integrated commercial and transport hub is being planned for the site, which will comprise office towers, serviced residences, a mall and shoplots worth more than RM6 billion overall. The project is part of the Economic Transformation Programme (ETP) under the New Economic Model (NEM) to turn Klang Valley into the Greater Kuala Lumpur economic district and Malaysia into a high-income nation by 2020. It was reported that China's Everbright International Construction Ltd had submitted a bid to develop the hub for around RM3 billion. UDA had also recommended Everbright as its partner for the redevelopment after a shortlisting process but it was rejected by the Ministry of Finance (MOF). The MOF then instructed UDA to set up a steering committee to oversee the redevelopment and split the 8ha land into three parcels. MOF wants two parcels to be given to Bumiputera companies to boost their participation in land development projects in the country. One parcel is to be given to a non-Bumiputera firm. Deputy Finance Minister Datuk Dr Awang Adek Hussin said the government would be flexible in allowing the Bumiputera companies to partner non-Bumiputera firms to develop the two land parcels. "But there must be full Bumiputera participation in the land development," he said at the launch of the 3-star Ancasa Express Hotel at Pudu Sentral and UDA's own 40th anniversary corporate stamps yesterday. KUALA LUMPUR: The Government, via the Finance Ministry (MoF), has instructed UDA Holdings Bhd to split its re-development plans for the Pudu Jail land into three parcels to ensure more bumiputra participation in the project. UDA chairman Datuk Nur Jazlan Mohamed said that of the three parcels, two would given to bumiputra investors to develop, while UDA would develop the balance parcel. The Pudu Jail redevelopment project has already been named Bukit Bintang City Centre. “We are doing a new master plan for the development. The Government wants more participation of bumiputras in the real estate sector in Malaysia,” he said yesterday after the launch of UDA's “40 years” personalised corporate stamp and the opening of Hotel Ancasa Express @ Pudu. Nur Jazlan remarks confirm earlier reports that UDA had been instructed by its shareholder, the MoF, to carve up the land. File picture of Pudu Prison. The site has vast potential and has been named Bukit Bintang City Centre. “UDA will be the main developer for the project. For the two plots, bumiputra developers will be sourced through open tenders and they need to be financially capable,” he said, adding that Pudu Jail was expected to be developed as a “transport hub”. The Pudu Jail land on 8.09ha close to Berjaya Times Square in Kuala Lumpur has vast potential for high-end mixed development. It is reported the Government had dropped a mainland Chinese developer's US$1bil (RM3bil) redevelopment plan in favour of splitting the prime site into parcels to be developed by mainly bumiputra companies. UDA is said to have come under fire recently for allegedly abandoning the bumiputra agenda by not appointing bumiputra joint-venture turnkey investors for the proposed Bukit Bintang City Centre but Nur Jazlan had denied the allegation. SINGAPORE: The number of new private homes hitting the market this year would likely be the highest in a decade, thanks to a surge of launches recently, said analysts. Experts said that about 18,300 new homes could be released this year, surpassing the 16,500 last year the highest so far in a decade and easily trumping the annual average of 9,900 between 2001 and 2010. The numbers have been rocketing this quarter as developers rush out homes in what is usually a quiet period. There were several major launches in October and last month, including Sim Lian's Parc Vera condo in Hougang, City Developments' The Palette in Pasir Ris, and Bedok Residences from CapitaLand. More new projects were likely to follow this month, said industry watchers, bucking the festive season trend for a sales slowdown. Rushing to release projects earlier allowed developers to ride on the prevailing home-buying momentum, said Chia Siew Chuin, director of research and advisory at Colliers International. “Some developers have managed to expedite the sales preparation process and shorten the period from a typical timeline of between nine and 12 months to between six and nine months,” Chia said. Pushing homes out for sale now also meant getting a headstart on the large batch of government land sales sites that were sold this year and which were expected to debut in the market next month, said Nicholas Mak, head of research at SLP International. An UOL Group and SingLand joint-venture started sales of its Archipelago project last Friday with average prices hovering just above S$1,000 per sq ft (psf). About 200 homes were expected to be launched in the first phase of sales. The UOL Group declined to reveal sales figures, saying more details would be released next week. Far East Organisation's 231-unit The Scotts Tower in Scotts Road will be launched next week, two years after plans to reconfigure the then 68-unit luxury development into smaller units were announced. Far East said in a statement on Monday that 34 of the 56 units released during the preview sales had been bought. Prices started at S$1.94mil, or S$3,109 psf, for a 624-sq-ft one-bedroom SoHo apartment. Far East's The Hillier, a 528-unit project in Hillview Avenue, near the upcoming Hillview MRT station, and the 435-apartment The Nautical in Sembawang, being built by MCC Land, would be launched within the next two weeks. Agents said prices at The Hillier were expected to be around S$1,200 psf, with 503-sq-ft one-bedroom units to go for about S$750,000. Indicative prices for The Nautical are expected to range between S$850 and S$1,000 psf. PETALING JAYA: Ekovest-MRCB JV Sdn Bhd (EMJV), a 60:40 joint venture between Ekovest Bhd and Malaysian Resources Corp Bhd (MRCB), has been appointed the project delivery partner (PDP) by the Government to assist in the implementation and delivery of the River of Life (ROL) project. Ekovest told Bursa Malaysia yesterday that the project was valued at RM2.2bil over three years. The value of the contract was only revealed yesterday. “As the PDP, it (EMJV) will earn a maximum fee of RM22mil, which is equivalent to 1% of the total projected works to be delivered over the three-year period. The PDP will also enjoy monetary incentives with respect to the river rehabilitation and beautification works,” it said. It did not elaborate on the monetary incentives. The ROL is an Entry Point Project identified in the Greater Kuala Lumpur National Key Economic Area under the Government's Economic Transformation Programme. It aims to transform the rivers running through the heart of Kuala Lumpur by undertaking river rehabilitation, beautification of riverbank and river corridor development. The ROL project entails the rehabilitation of the Klang and Gombak Rivers, and the beautification works on an initial 10.7km stretch. Ekovest said the PDP project would not have an immediate effect on the company's earnings per share and net tangible assets for the current financial year ending June 30, 2012, but it was expected to contribute positively to the future earnings of the company. In February, MRCB announced to Bursa Malaysia that the Ekovest-MRCB joint venture had received a letter of intent from the Government for the ROL project. The following month, MRCB and Ekovest signed an agreement to set up a joint-venture company known as KL Bund Sdn Bhd to undertake the ROL project. Kuala Lumpur Mayor Tan Sri Ahmad Fuad Ismail was reported in August as saying said the PDP would not be allowed to bid for government land near the Klang River as long as the joint-venture company remained the Government's partner in the upgrading of the river. He said this was due to its competitive edge over others, given that it had access to information in its role as PDP. KUALA LUMPUR: Malaysian Resources Corp Bhd and Ekovest Bhd says Ekovest-MRCB JV Sdn Bhd signed a project delivery partner pact with the government for the River of Life development.